The adorable black-cheeked lovebird is without a doubt the epitome of the Africa's avian diversity. 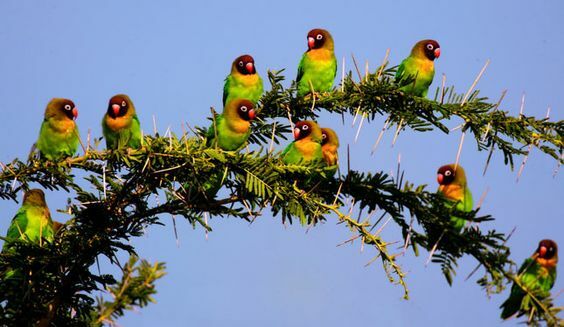 A distant cousin of the commonly domesticated parrot, the lovebird boasts the same sturdily built physique complete with the characteristic screeching chatter that is synonymous with lovebirds. But that's where the similarities end. 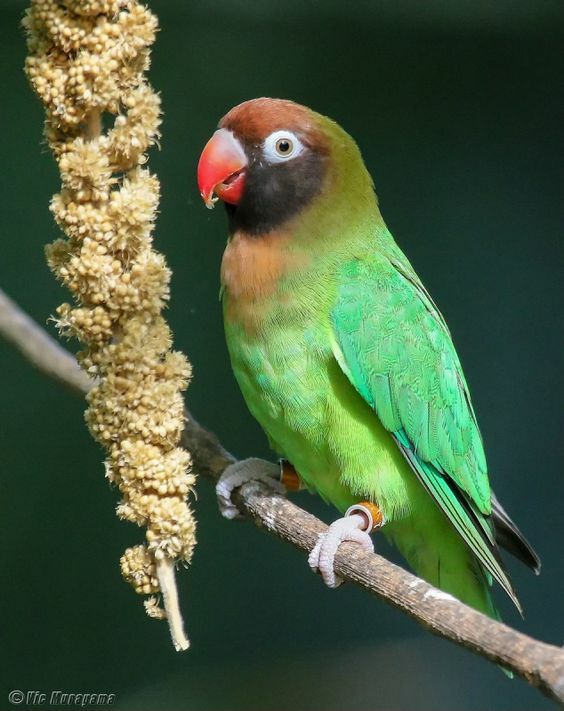 Unlike the parrot, this wild lovebird is well-known for its bright-green luster that is often complemented by a gorgeous dark brown head, a pair of milky white eye-rings, an olive nape, and a red bill that matches seamlessly with the bright orange patch on the bird's chest. If you're an avid bird watcher or have a particular interest in the parrot family of birds, you may be wondering how this exotic bird originally from interior Zambia has found its way to our homes in Europe or the United States. Between the late 1920s and early 1960s, the lovebird was heavily hunted and exploited for sale thanks to the booming cage-bird trade. The sweet, black-cheeked lovebird is highly averse to drastic climate change, which explains why only a few birds survived the forced removal from Africa to western countries. During the beginning of the 20th century, the blossoming cage-trade of wild birds did not pose a significant threat to the then thriving community of black-cheeked lovebirds. However, the gradual destruction of natural water catchment areas in the 1950s and 1960s in rural Zambia greatly diminished the habitable grounds that could support the breeding of this bird. Around the same time the locals began to actively hunt down the bird after it started inflicting serious damage to sorghum and millet crops in farms next to the forests. Fortunately for the lovebird, the worldwide ban on cage-bird trade in the mid-20th century saved it from further decimation. What's more, a series of deliberate and progressive efforts from wildlife conservationists in Zambia and South Africa has promoted the thriving of the remaining population. Even so, the lovebird is classified as 'Highly Vulnerable' on the global IUCN Red list, showing that the bird still has a long way to go to reach its former numbers. Where can I see the black-cheeked lovebird? The bird is native to South-west Zambia, more specifically within the catchment areas of Kafue and Zambezi rivers. A birding safari along the banks of the Zambezi is the best way to view these remarkable birds.